I told my husband I had steampunked his avatar and made him log in to see what I’d come up with so we could snap a few pics. Well while he didn’t do much more than stand there and provide some tasty arm candy, I’d say it was quite steamy… until he teleported away to go explore some Star Trek sim. :P I really loved these outfits and I think we’ll be sporting them for a while. I also would like to express my love for OMFG and all the awesome, awesome steampunk goodness for only L$ 1. So cool! 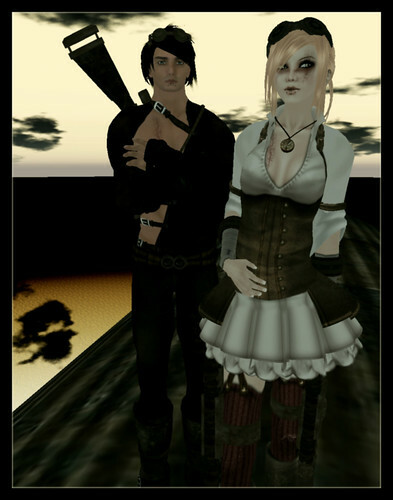 This entry was posted in Pictures and tagged GothiCatz, League, OMFG, Second Life. Bookmark the permalink. Oh I wish I could make a male skin.. I’ve tinkered around with one and it came ok but nothing special. The hardest part is breaking away from making it look feminine. I certainly know why men’s skins are such a high ticket item, they seem very hard to get right.